In the archive at Historic Environment Scotland we hold more than 500 unique photograph albums. They are a valuable resource for anyone interested in the built heritage and Scottish local and social history. 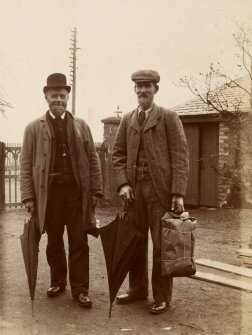 The albums range in date from the 1850s through to the 1950s and include amateur and professional photographs of towns, cities and buildings as well as family photographs. 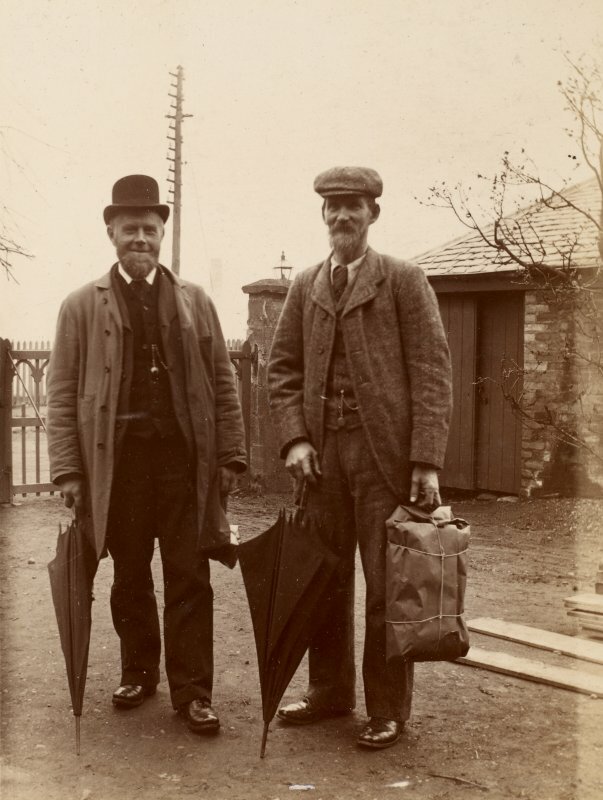 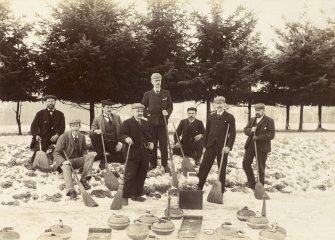 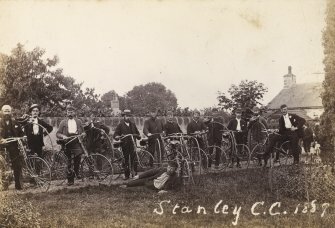 The Stanley Album dates to c1889 and contains 55 photographs of buildings, industries, stations and topographical views as well as family portraits, workmen, farming and local groups, including Stanley Cycling Club and a curling club. The photographs are mostly from Brora, Sutherland and Stanley, Perth and Kinross, however some of them are unidentified. 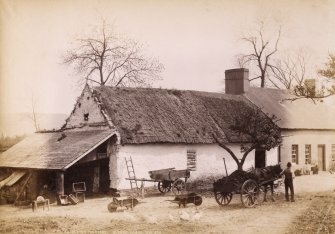 The album also include views of Taymount House and Kintradwell House, photographs from cottages in County Antrim, Northern Ireland and a set of prints from Norway. The archive can be consulted in our Search Room and through our online resources. 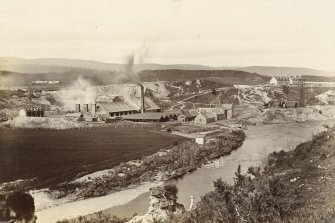 This include Canmore where new images and information are added every day through ongoing surveys of Scotland's built heritage, as well as through an active digitisation programme of negatives, prints, albums and drawings. 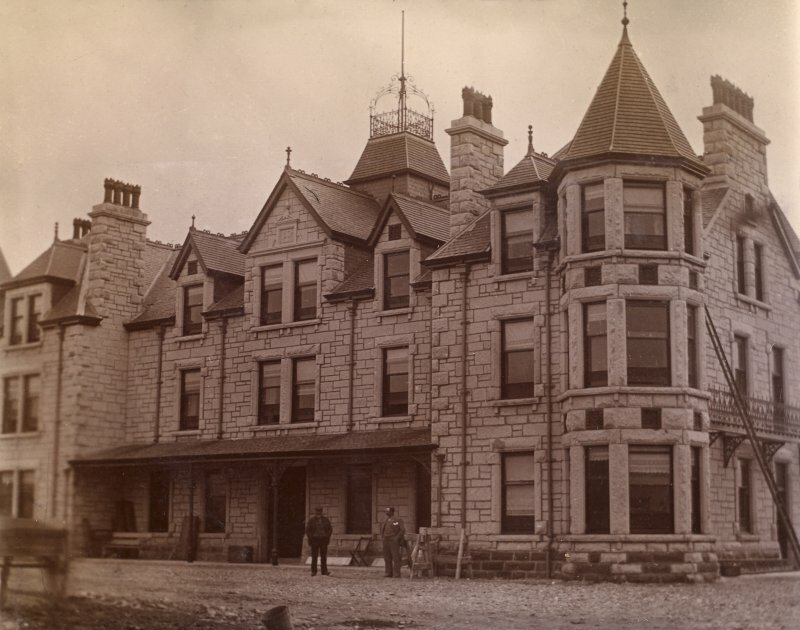 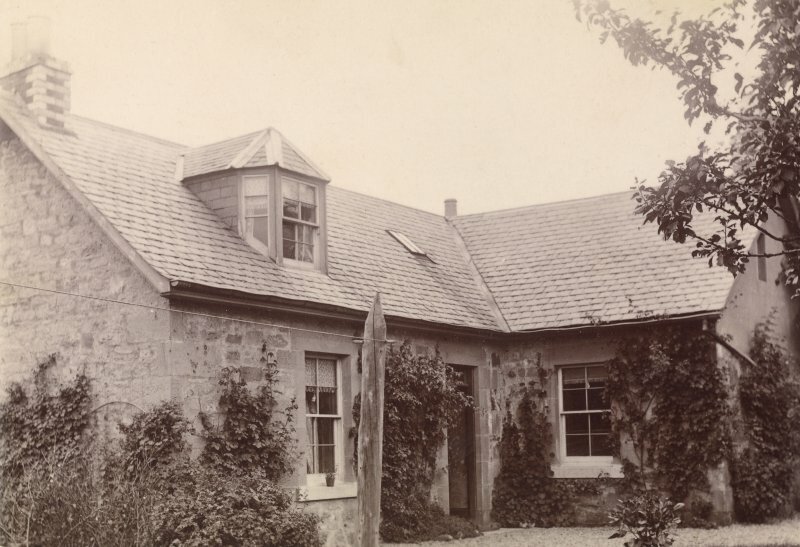 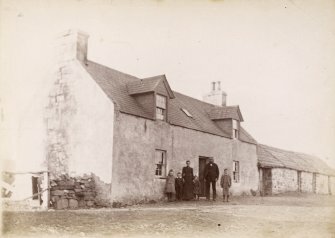 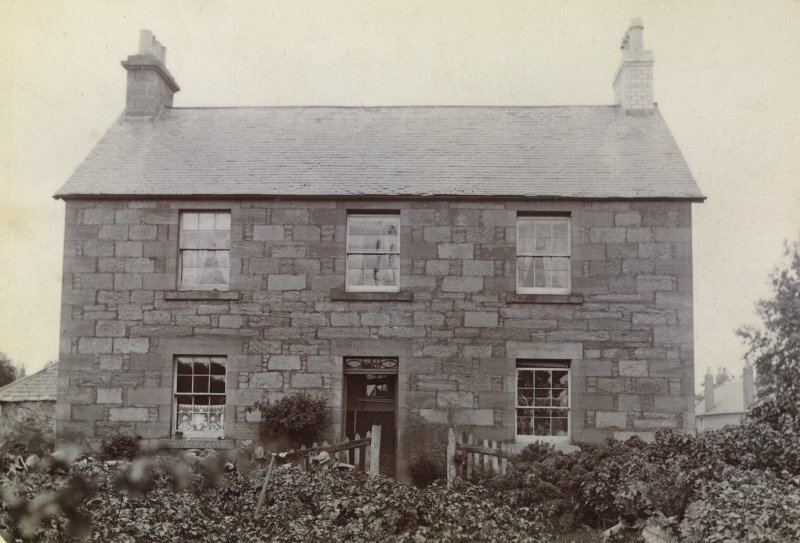 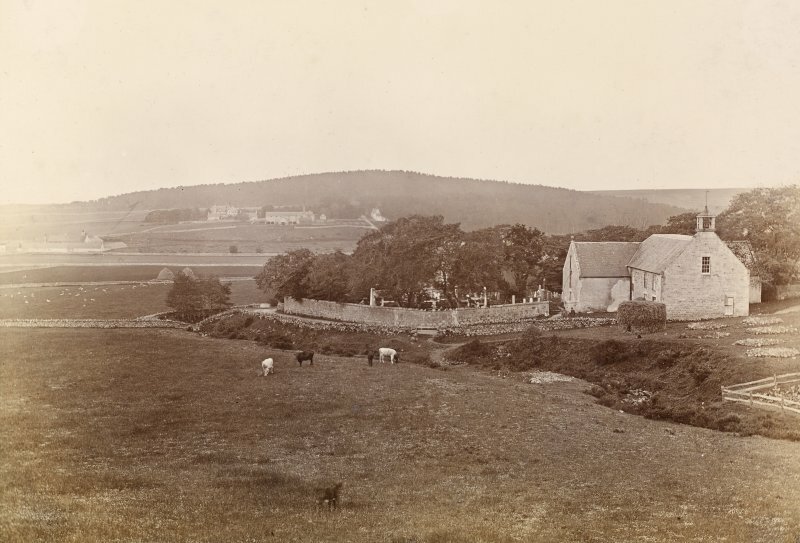 View of building, possibly in Brora, with family group outside. 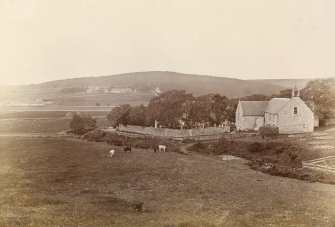 General view of building and surrounding landscape. 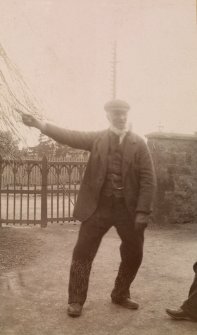 Titled: 'Clyne, Sutherlandshire'. 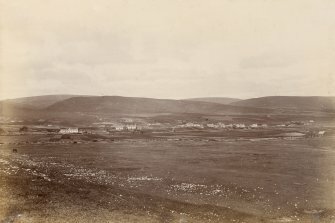 Distant view of East Brora. 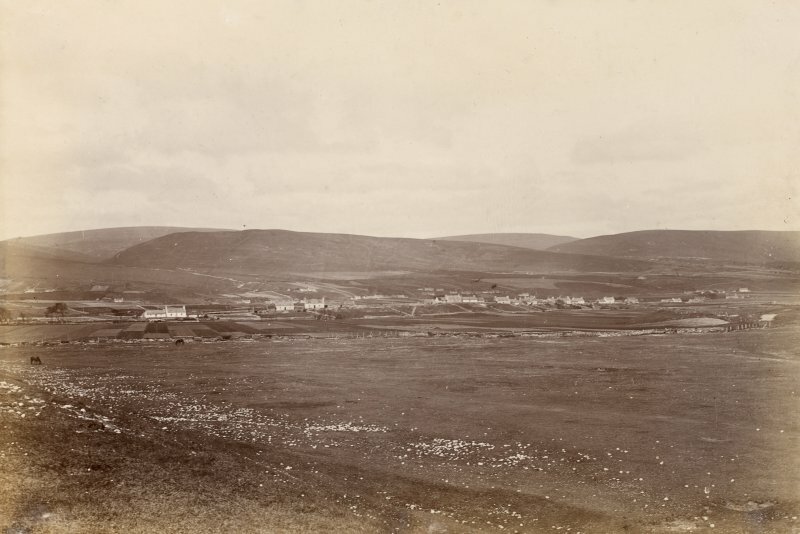 View of hills and settlement possibly near Brora. 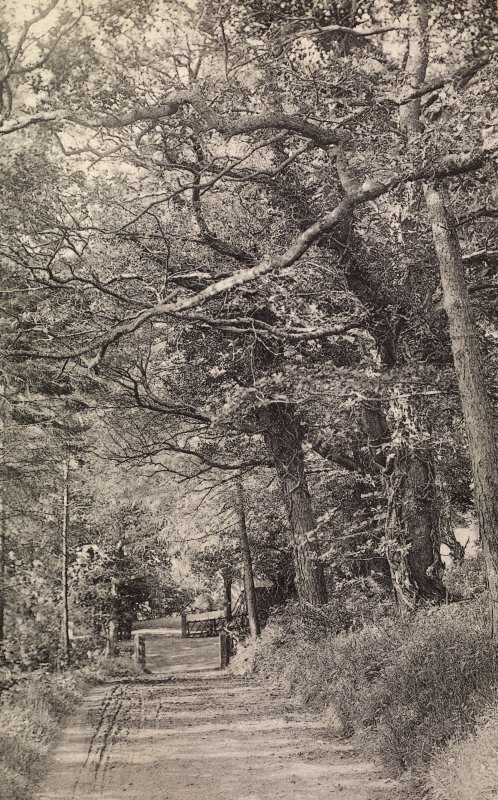 Titled 'Dulchulm'. 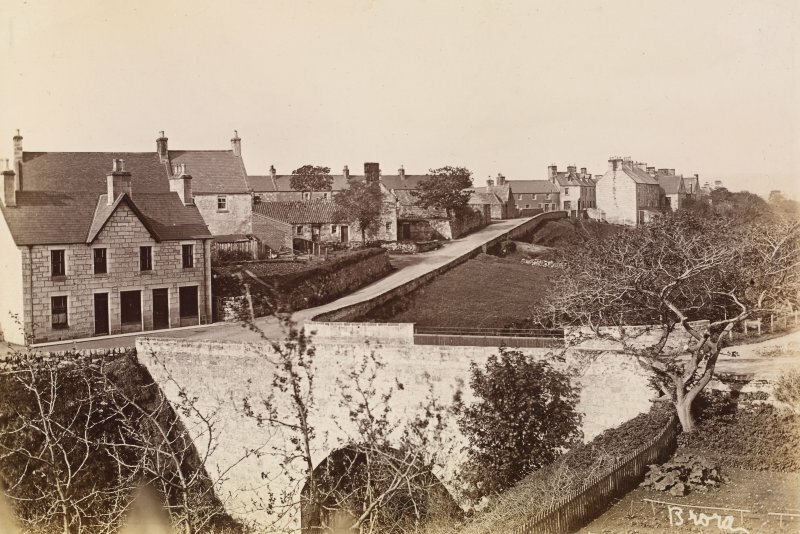 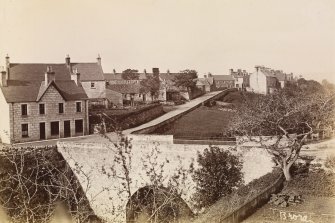 General view of Brora showing bridge over railway. 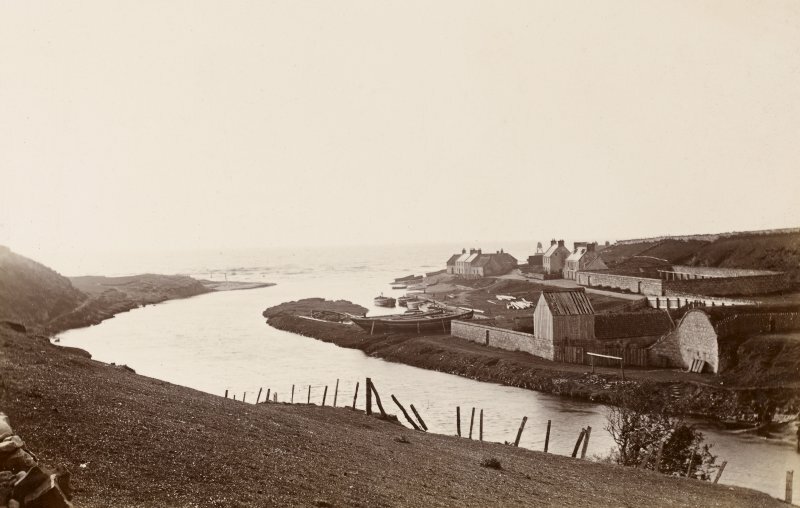 General view of Brora harbour. 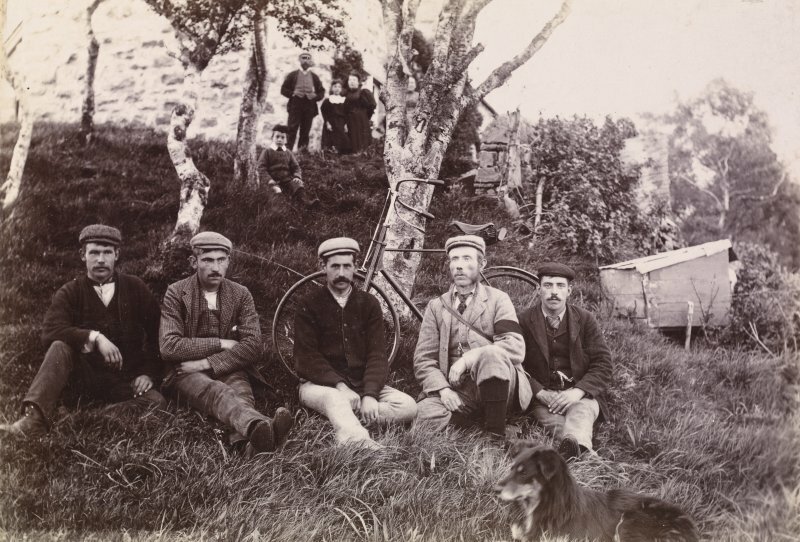 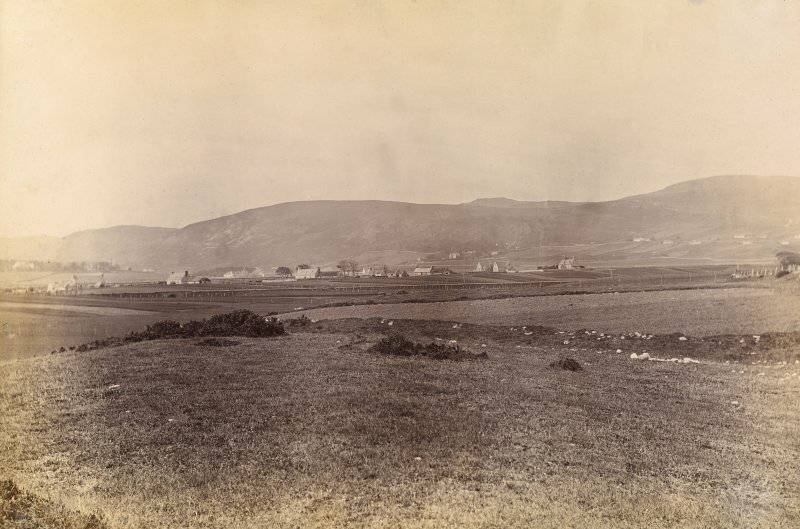 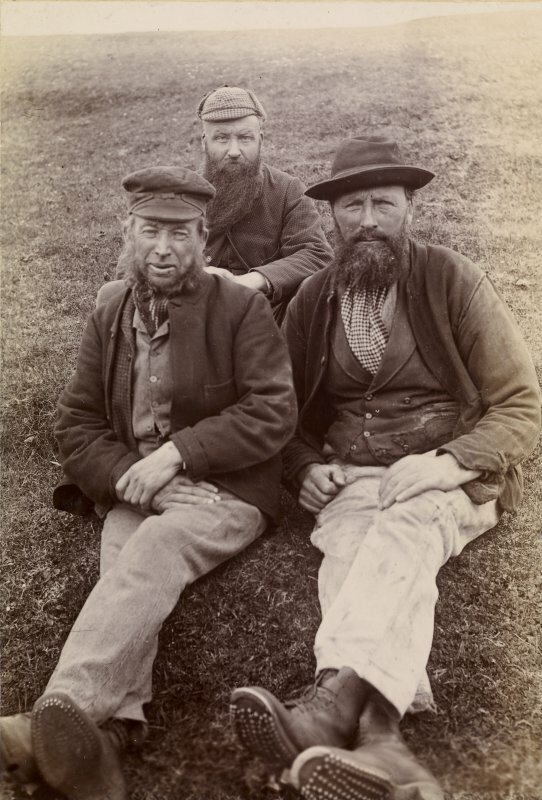 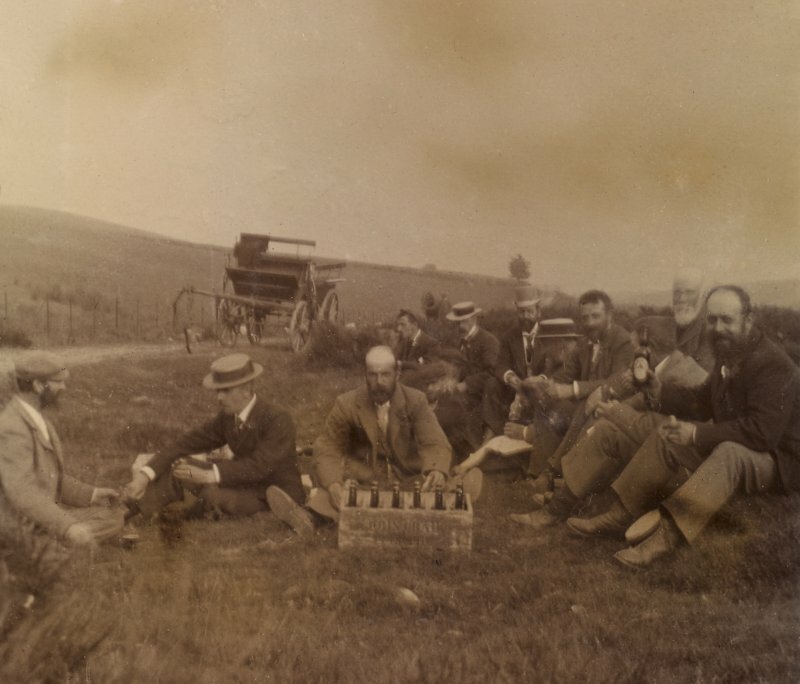 View of group of men sitting on grass bank with dog and bicycle, possibly in the Stanley or Brora area. View of cottages and a man with a horse and cart with farm implements, Glende Larne, Ulster. 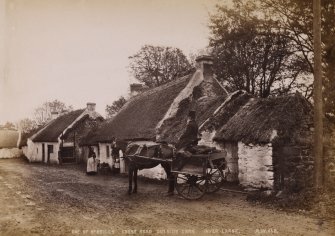 View of cottages with women at the door and a horse drawn buggy with driver. 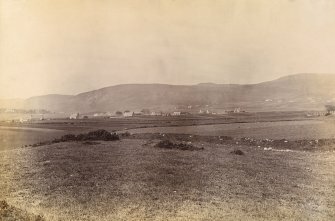 Titled: 'One of McNeill's. Coast Road Outside Cars, Inver Larne, R.W.468'. View of two men with horse and plough working above the village. 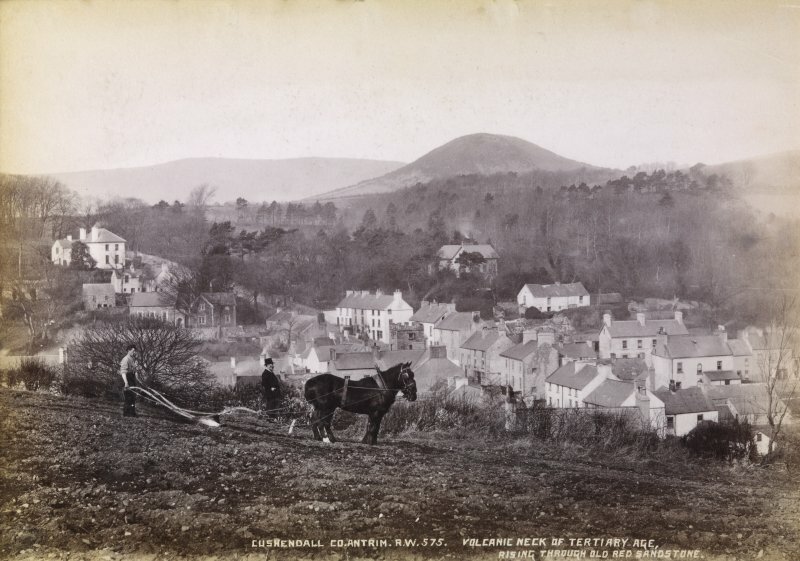 Titled: 'Cushendall, Co. Antrim. R.W.575. Volcanic neck of Tertiary age rising through Old Red Sandstone'. 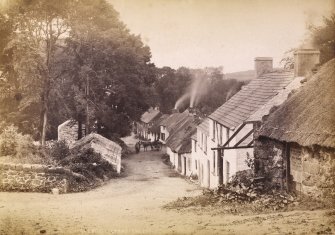 View of village street with thatched and slated cottages in Glende, Larne. 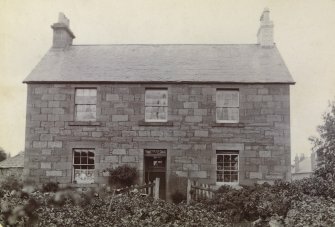 View of two storey house, possibly in Stanley. 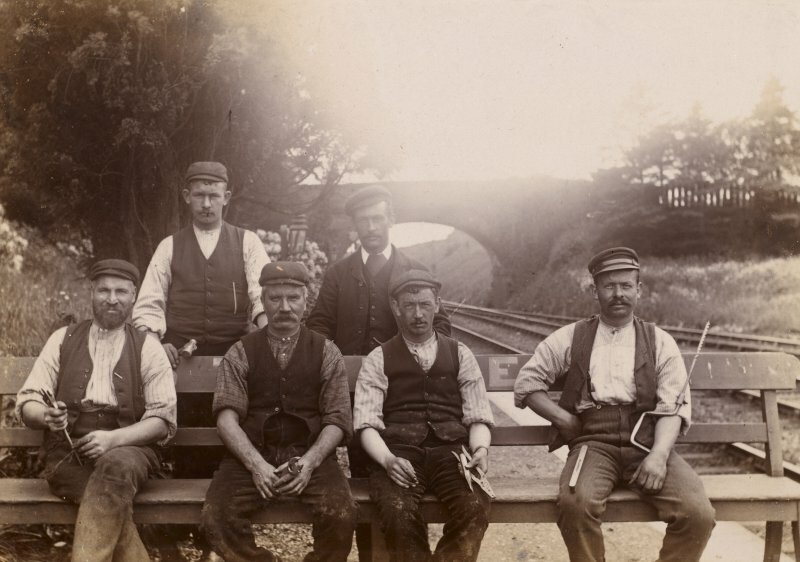 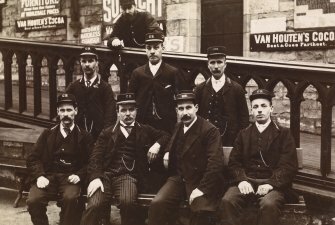 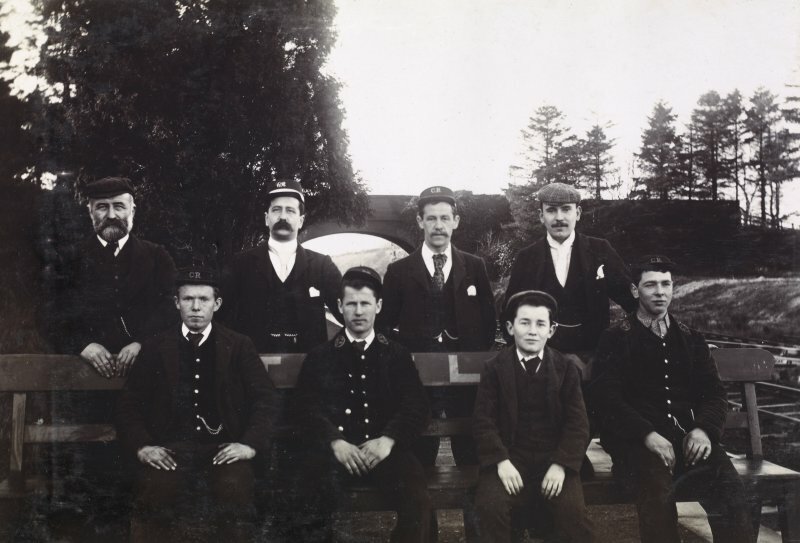 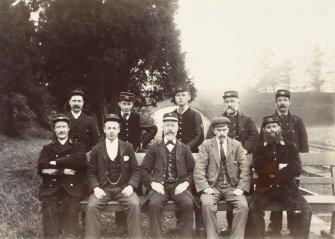 View of a group of eight railway employees, possibly at Stanley Junction. 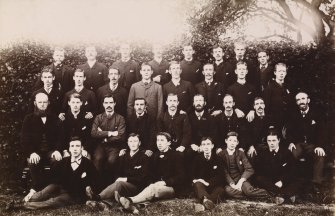 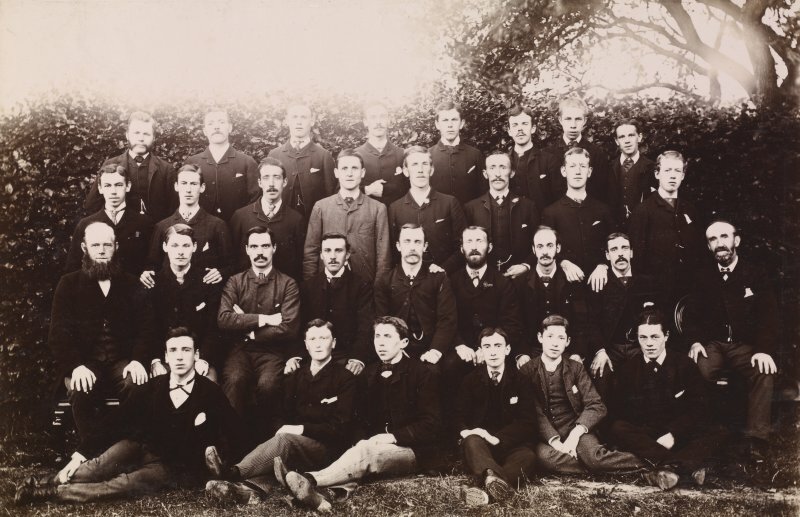 Group photograph showing 31 men. 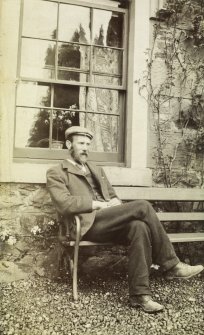 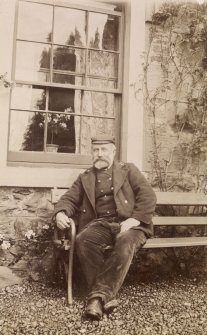 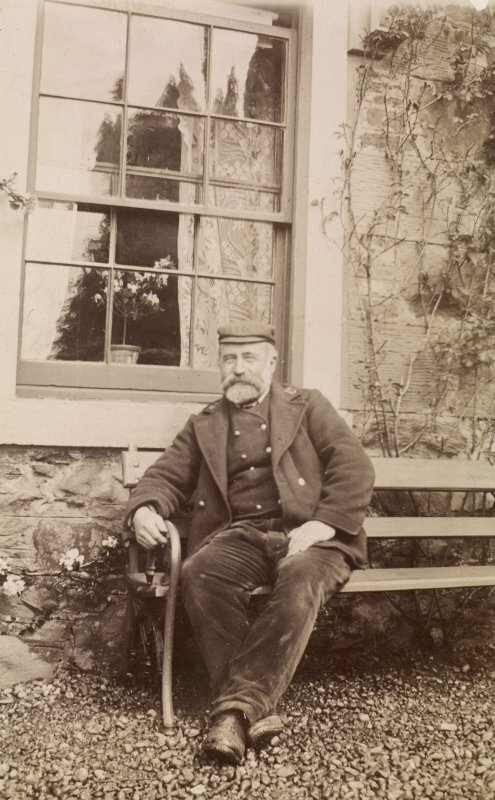 View of bearded man sitting on a bench possibly in Stanley. 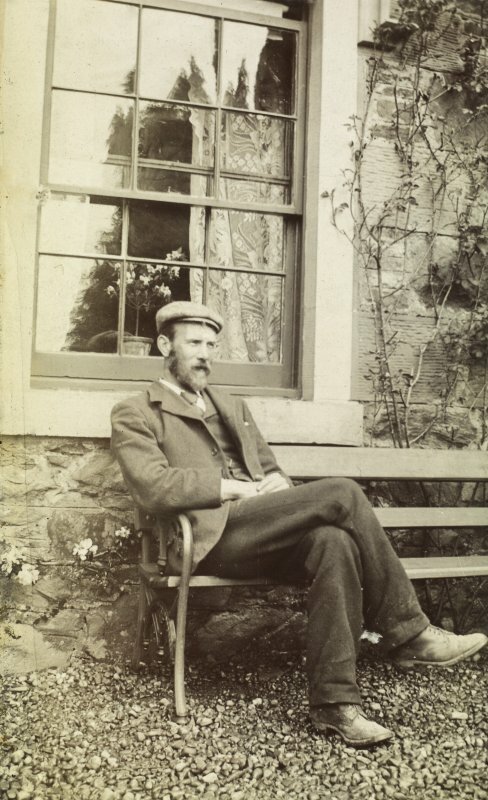 View of bearded man possibly in Stanley. View of man near timber bulding, possibly in Stanley. 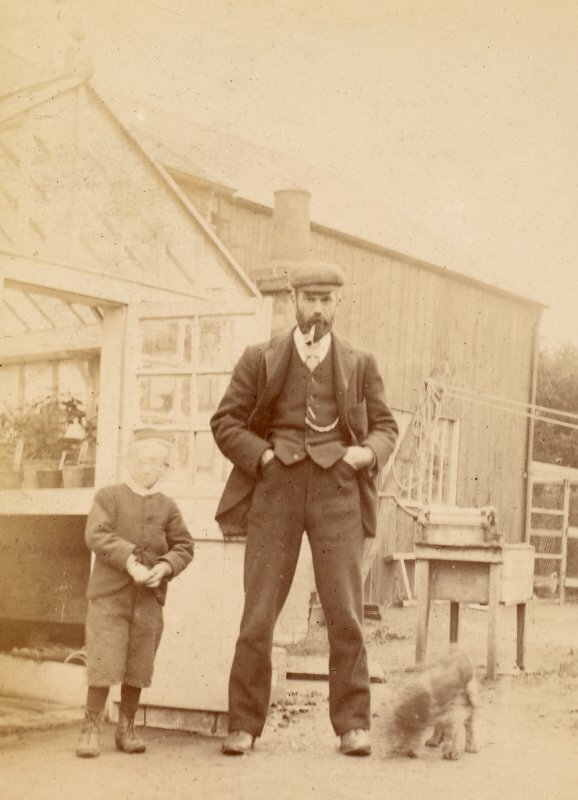 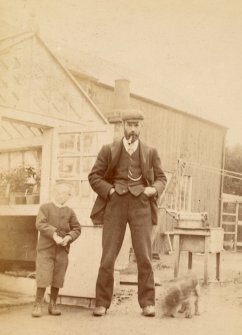 View of man and boy with dog, possibly in Stanley. 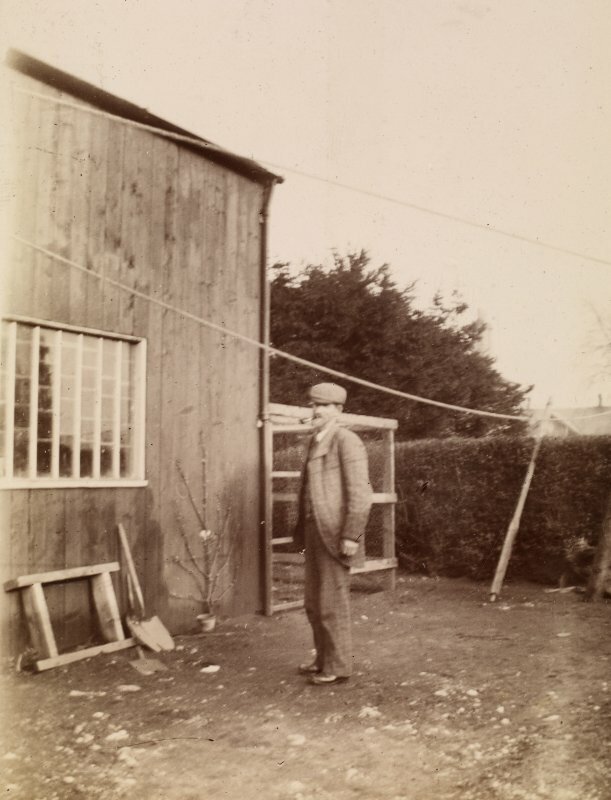 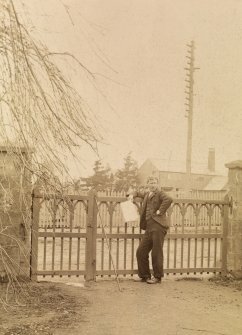 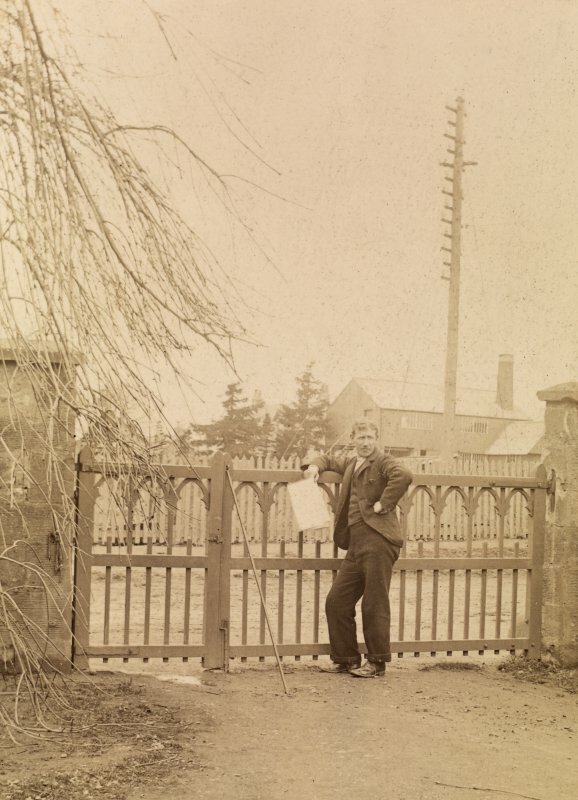 View of man at gate, possibly in Stanley. 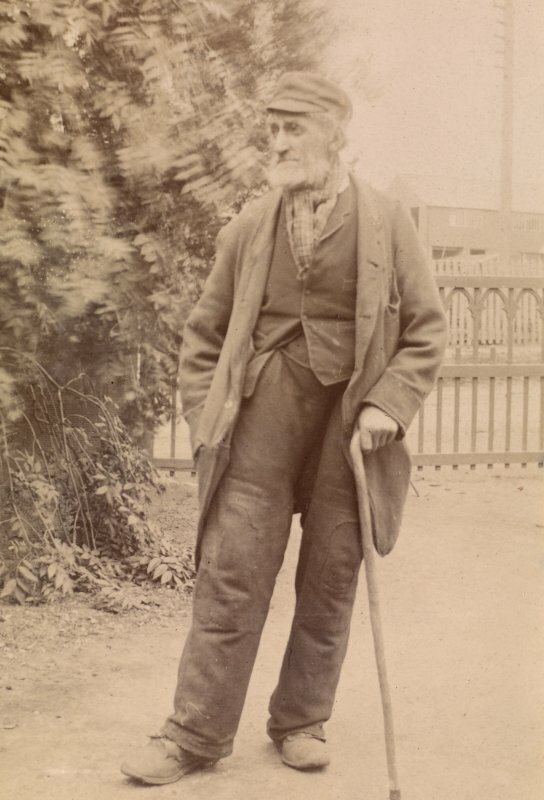 View of bearded man with walking stick, possibly in Stanley. 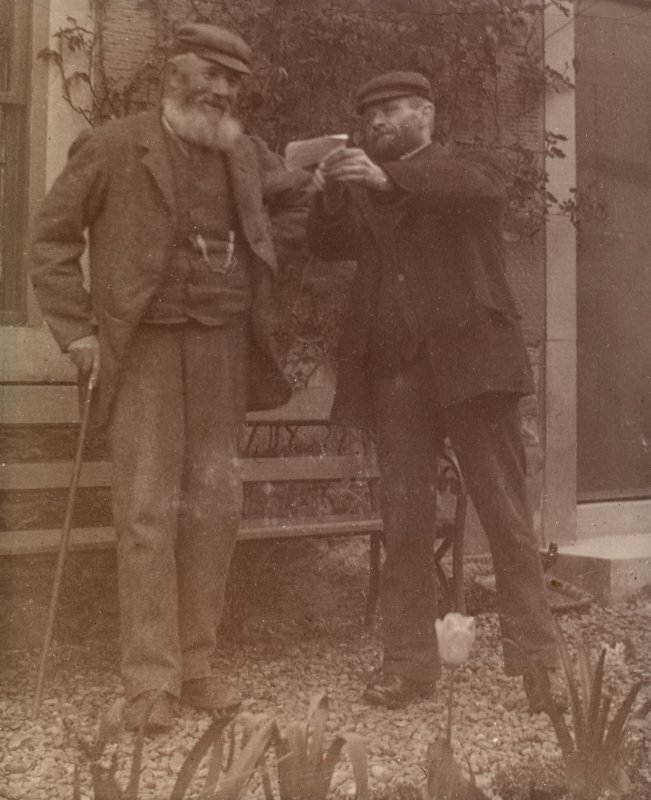 View of two bearded men looking at a paper, possibly in Stanley. 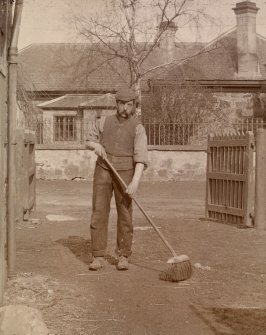 View of man sweeping yard, possibly in Stanley. 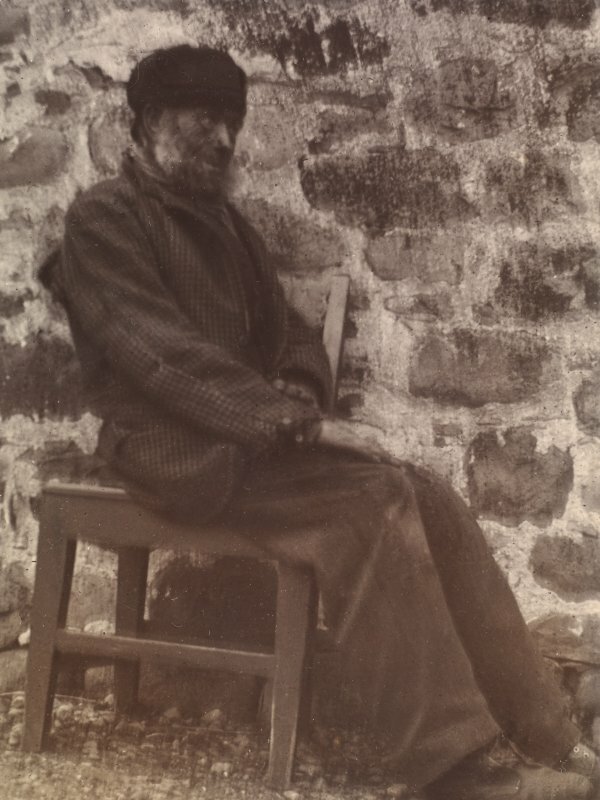 View of seated man wearing fur hat, possibly in Stanley. 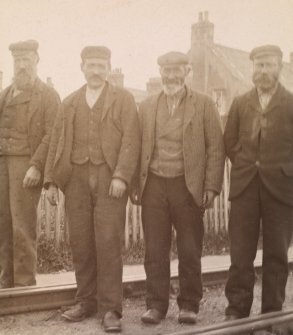 View of four men standing on railway line, possibly in Stanley. 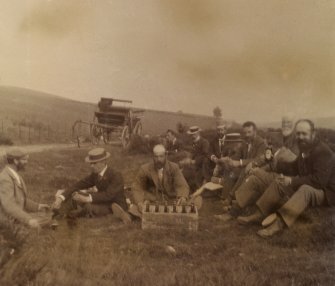 View of group having picnic. 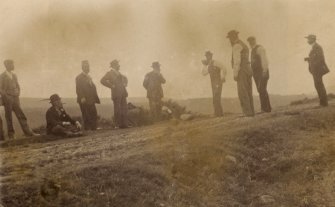 View of group of men on moorland road. 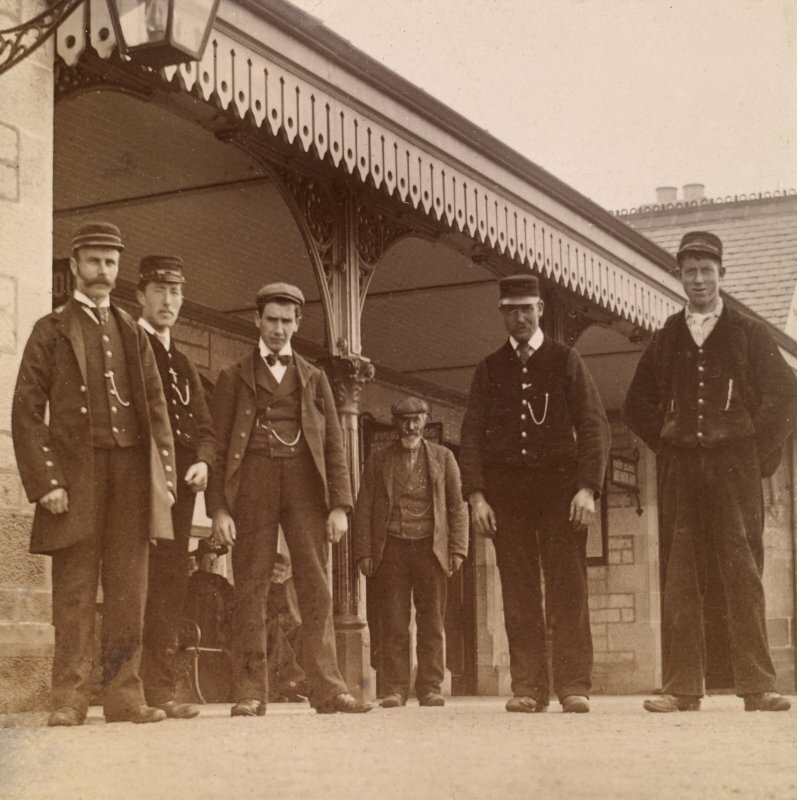 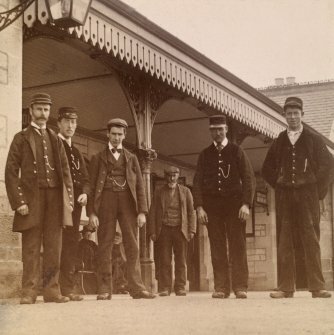 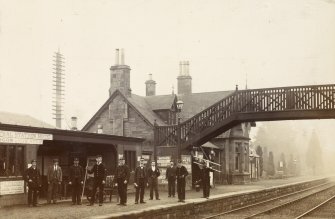 View of six men, some in railway uniform, on station platform, possibly in Stanley. 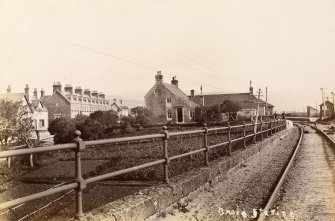 View of building with gables and turret, possibly in Stanley. 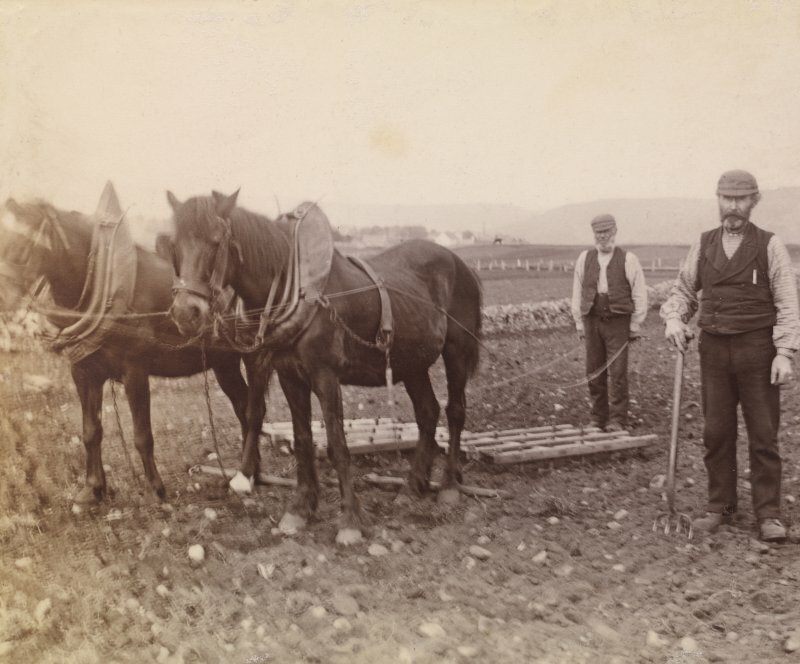 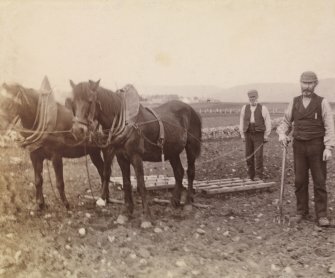 View of two bearded men with two horses and harrow in field, possibly in the Stanley area. 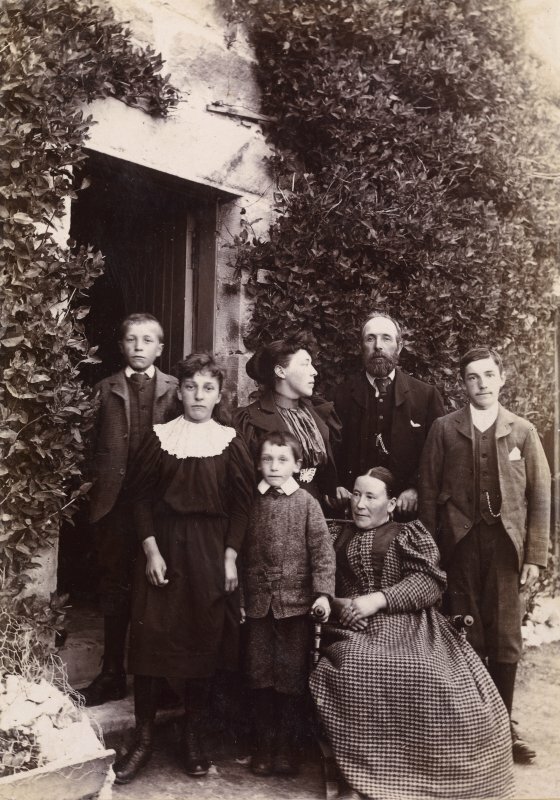 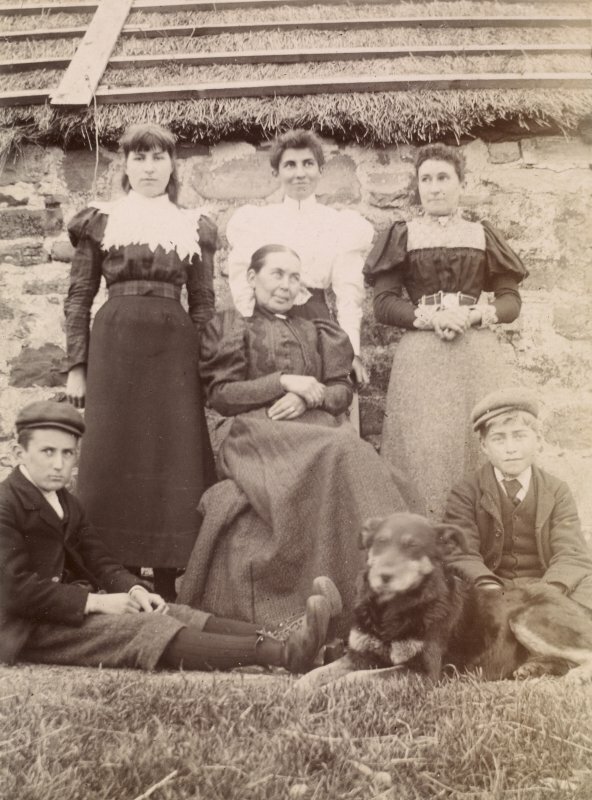 View of family group, possibly in Stanley. 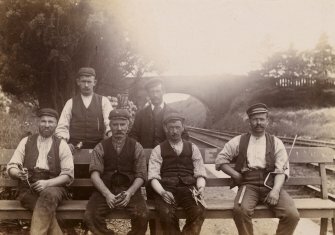 View of five railwaymen with bridge in background, possibly near Stanley. 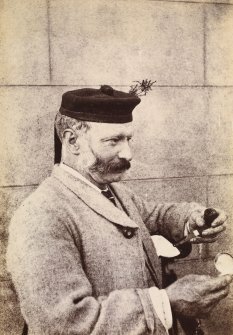 View of man in tweed jacket with heather in cap and holding pipe and watch. 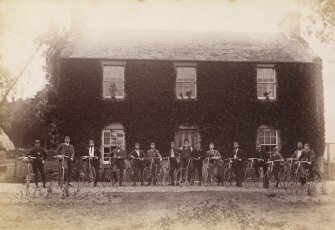 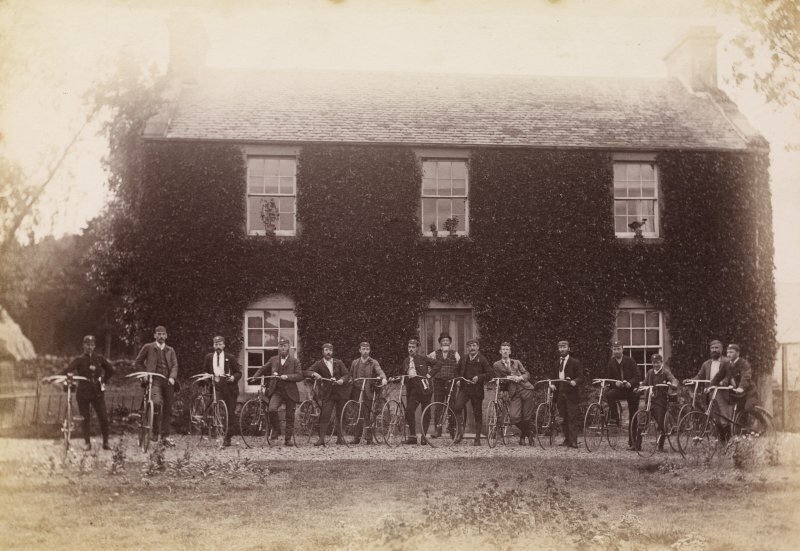 View of group of fifteen men with bicycles outside an ivy-clad house, possibly in the Stanley area. 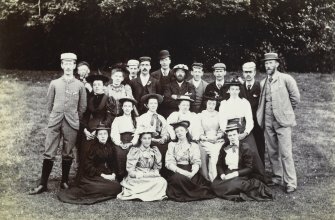 View of group of about 22 men and women in a garden, possibly in Stanley. 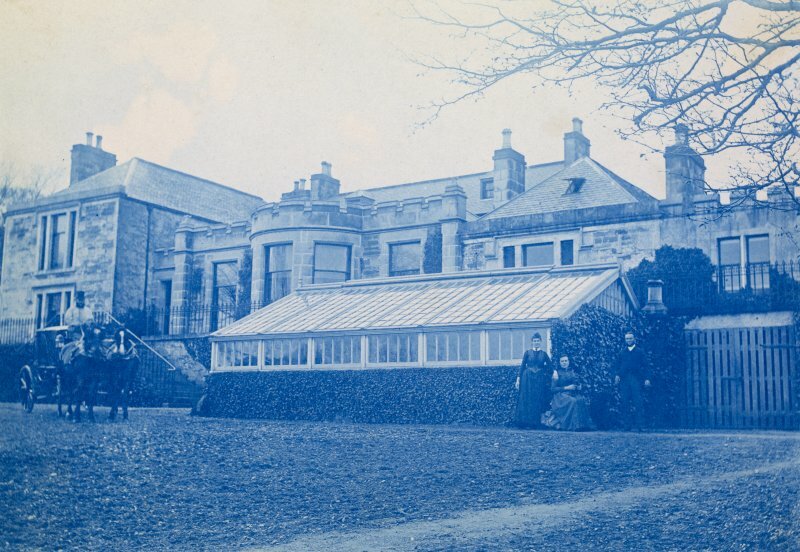 View of large house and glass house, with coach and pair with driver and three ladies seated in garden, Kintradwell. 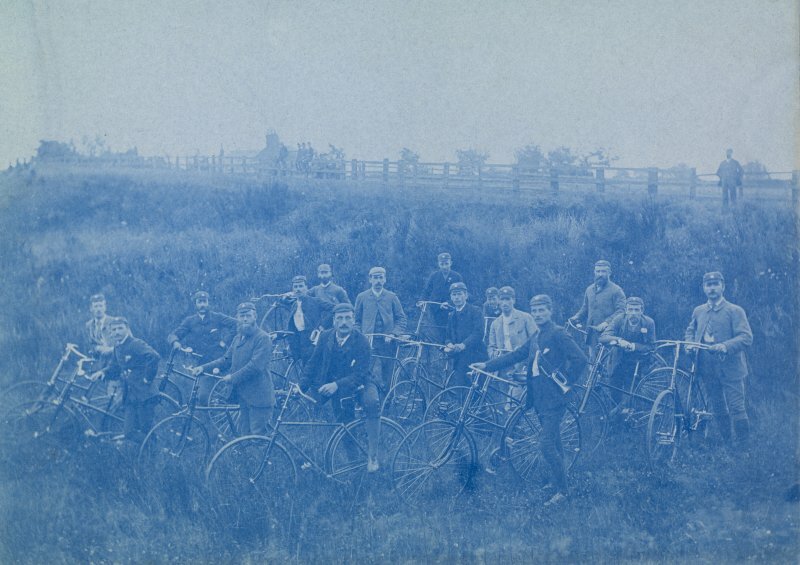 View of group of men from the Stanley Cycling Club with bicycles in a field. 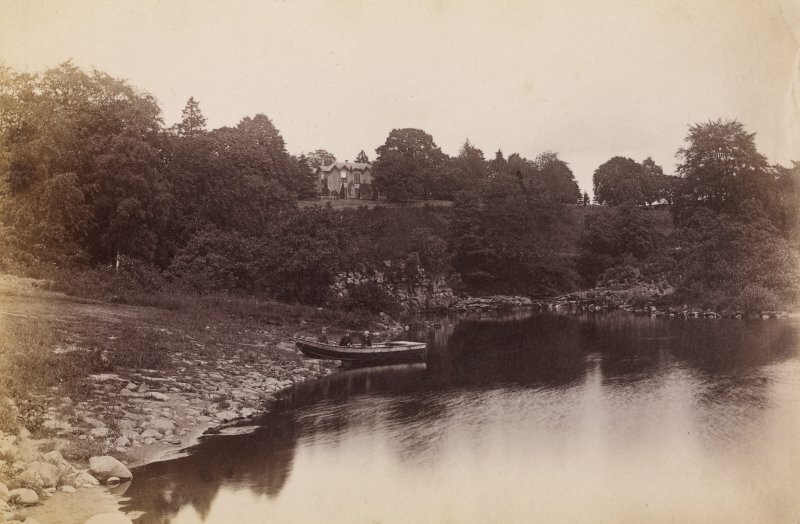 View of Taymount House above the river showing three people in a boat. 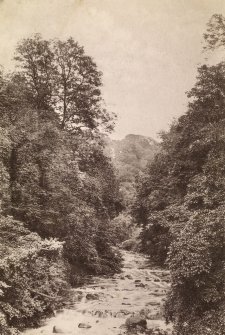 View of burn in Dunrobin Wood. 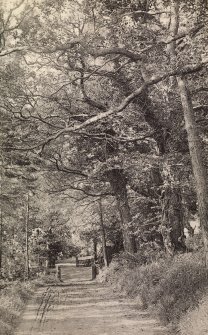 View of track through trees in Dunrobin Woods. 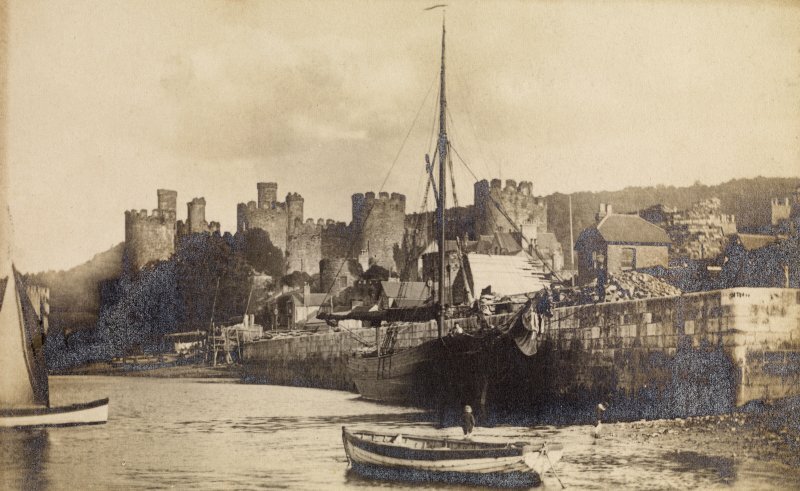 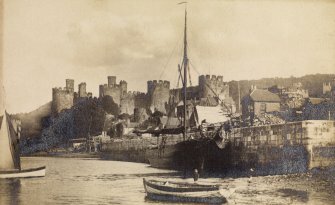 View of Conwy Castle, Wales, with sailing boats. 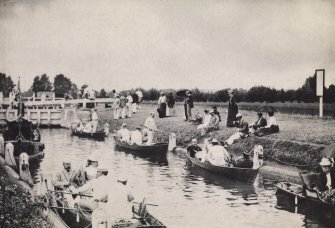 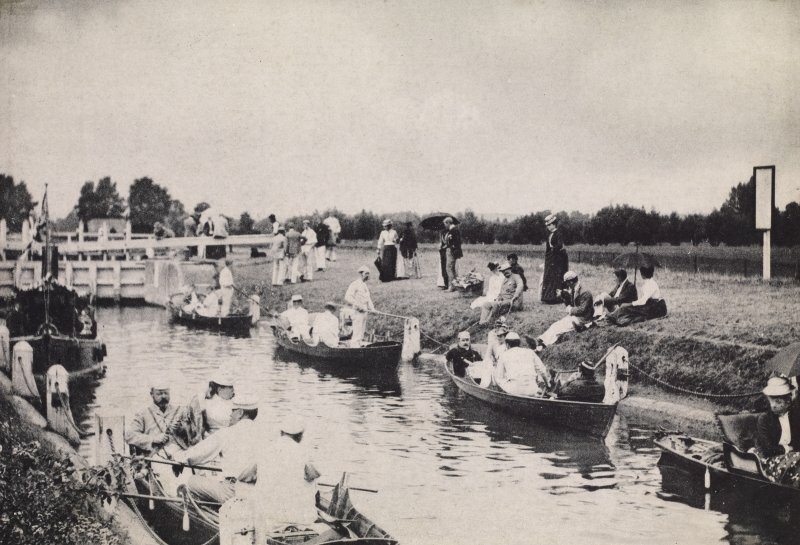 View of people in rowing boats on an unidentified canal.